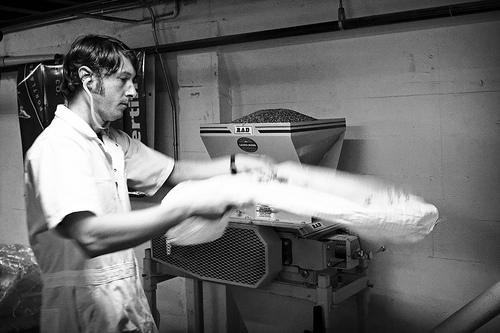 Dustin Kellner, Laurelwood Brewing Company. This is one of the first photos I took at a brewery. Just over three years ago, I talked to the Paul Bergeman at Laurelwood Brewery on NE 40th Avenue to see if he'd mind if I came in to shoot the brewery on a brew day. No one else knew I was coming, so imagine showing up to work at 7:00am to find a strange guy following you around with a camera while you work. For hours. That's the situation Dustin found himself in that morning. Sorry buddy! I quickly learned to be splashed, singed, deafened, and grain-dusted on these shoots. But it's all worth it since I usually get to sample off of the tanks by 9am!